I've been waiting a long time to feature today's amazing artisan. As an admirer of their work since the first time I discovered this shop, I waited patiently for the shop to fill with beautiful items and gorgeous photographs because I wanted to make sure when I featured them that there would be plenty to look through and admire. A true showcase of the artisan's work. Now, I believe they have reached that point and I'm honored to introduce NY Beadworks Handmade Jewelry Designs on Etsy. Based out of Long Island, in New York, this artist has a beautiful vision and works exclusively with crystals and beads to weave and twist together in unique, breathtaking designs full of beauty and shimmer. 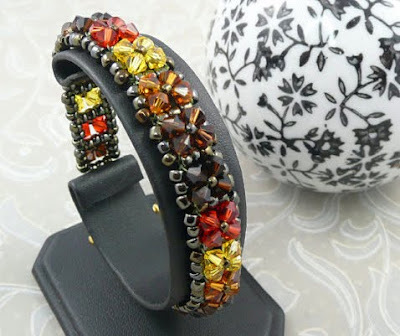 These beadwoven jewelry designs are created using mostly crystals, other glass beads and seed beads and each piece is an amazing piece of jewelry that's sure to add a little sparkle to any outfit whether worn to dress up everyday attire or wear with something elegant and special. YOU CAN CLICK ON THE PICTURE ABOVE TO VISIT CRYSTALTWISTER'S NY BEADWORKS SHOP ON ETSY AND TAKE A LOOK AROUND OR, IF YOU PREFER, YOU CAN CLICK RIGHT HERE. If you like what you see in CrystalTwister's shop, you may also enjoy stopping by to say hi to the artist on Facebook!